David Domke is Professor of Communication and Head of Journalism at the University of Washington. Kevin Coe is a doctoral candidate in Speech Communication at the University of Illinois. 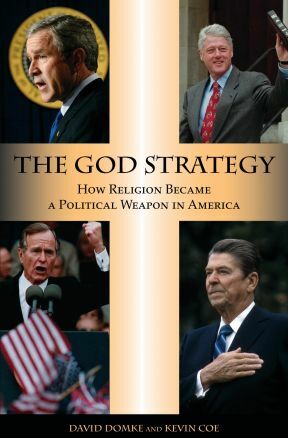 They are authors of the The God Strategy: How Religion Became a Political Weapon in America. To learn more about the book check out their handy website here, to read more posts by them click here. Below Domke and Coe look at the effects of MLK’s legacy on the Democratic primaries. Martin Luther King Jr. Day has now come and gone, but King’s presence is still being felt in the Democratic primary. Harnessing Dr. King’s memory has always been a political prize, but it is especially valuable now with the Democratic primary in South Carolina arriving Saturday. The stakes could not be higher: Black voters are expected to make up as much as 50 percent of the Democratic electorate in the Palmetto State, and large numbers are devoutly religious. Democratic front-runners Hillary Clinton and Barack Obama have worked hard to appeal to these voters. Clinton made an early misstep shortly before the New Hampshire primary by making a comment that some took as diminishing King’s importance in securing support for the Civil Rights Act. In days afterward Obama and Clinton traded criticisms and accusations through news media and campaign surrogates. The two candidates reached a rhetorical cease-fire last week, and Clinton joined Obama and John Edwards on Monday morning to celebrate King’s memory in an NAACP march to the South Carolina state Capitol. Clinton’s losses among African Americans have been Obama’s gains, as the Nevada caucuses last Saturday made clear. There, exit polls indicated that more than 80 percent of black voters chose Obama. Obama has had an easier time harnessing King’s legacy than has Clinton, in large part because he himself has drawn comparisons to the late civil rights leader. Obama’s time as a community organizer working with churches in some of Chicago’s poorest neighborhoods and his speaking style have fueled these assessments. On Sunday morning Obama made the connection more explicitly, giving a speech at King’s church in Atlanta that his campaign then e-mailed to supporters. Clinton and Obama both want to grasp King’s mantle—because they believe in his ideals and because they know his legacy brings sizeable capital. But King’s legacy is not only about race. King also was a religious leader whom many Americans—particularly on the political left—view as a model of how faith and politics should connect. And again, the stakes could hardly be higher. Our analysis of more than 15,000 public communications by political leaders from Franklin Roosevelt’s election in 1932—the beginning of the modern presidency—through six years of George W. Bush’s administration shows that since the political rise of religious conservatives in the late 1970s every successful presidential candidate has substantially emphasized religious faith. It’s a point the Democrats learned anew in 2004. Clinton too has made faith central to her campaign. In November she received a standing ovation after her speech at a Global Summit on AIDS and the Church hosted by Rick Warren, perhaps the most influential evangelical in the world. In South Carolina last week Clinton visited Columbia’s Northminster Presbyterian Church, where she worshipped, spoke, and even sang with the choir. As Clinton and Obama campaign in South Carolina and beyond, they’ll no doubt continue to embrace faith and emphasize racial equality. That the two leading candidates for the presidency are doing so is one measure of King’s legacy. That the candidates are a white woman and black man is perhaps an even more remarkable one.